Updated June 18: The display boards are now available online. Updated June 12: I have added a route map of the study area to help clarify the description current transit service in the area. I attended the Don Mills/Leslie LRT Project Public Consultation (PPC) meeting this evening (June 10). This was a first-round meeting where the initial concepts of the plan were being presented. There will be at least two other meetings, tentatively planned for October and December, as the plan develops as additional details (Transit City Don Mills LRT and the Highway 7 Rapidway) become available and public feedback from this meeting are considered. While there were no signs outside the Hilton Garden Inn at Commerce Valley East and Highway 7, the parking lot was completely full. Given that this location is quite easily accessible by transit, and that says a lot for York Region, the full parking lot ought to have been an indicator of the mood inside. The room was rather small as well, which probably did not enhance the help. The background for this is that Metrolinx identified in their Regional Transportation Plan (RTP), “The Big Move,” that the Don Mills/Leslie corridor from Steeles to Highway 7 should be an LRT corridor. Metrolinx is not exactly known for being all that open (many of their public meetings were held in the middle of a weekday), and some of the things in the RTP were rather questionable or even confrontational (building a crosstown line using ICTS/ART technology, despite Transit City plans over a year old), the idea of a Don Mills/Leslie LRT corridor was not simply pulled out of thin air (or any other place one might think of). Over the next decade, this corridor will only become much worse during rush hours and somewhat busier the rest of the time. Now, I do have a biased opinion on this project. It was my proposed alternative to subway construction that I first put forward in April 2008 that suggested a northern extension of the Don Mills LRT. In September, I noted that it was rumoured that this may become part of the Metrolinx RTP. The PPC showed proposed stops at all the locations I proposed, plus a few additional stops all south of the 407. The proposal also has the line running in a median right of way the entire distance, while I suggested a west-side right of way from just south of the 407. The study will likely also be looking at the possibility of extending this line all the way up to Major MacKenzie Drive. The word ‘hostile’ doesn’t quite capture the overall feeling of the crowd. 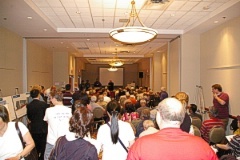 The bulk of the attendees appeared to be residents of the neighbourhoods along Don Mills and Leslie, as they should. When asked about the benefits this line would provide them (forget, for a moment about the heavy traffic and increasing bus noise and fumes that will only be getting worse without this line), the presenters asked if this line would be used by the people of the neighbourhood. The resounding answer was, “No!” No surprise to me, as I recalled the full parking lot outside. To be fair, most of those attending had difficulty grasping the concept that this was a first-round public consultation. The idea that this was practically a done deal and that the government would never really listen to input was pretty set in most peoples’ minds. I can’t really blame them, given that I felt the same way with the Yonge Subway extension plans. Of course, as we are now seeing, plans will only get you a chocolate bar if you have a loonie to buy it with. This project will not be breaking ground in six months when the new transit EA is completed, it will need funding, and it won’t get funding until the Transit City Don Mills line receives funding, and that is part of the second phase of Transit City. Even so, many people attending seemed to be under the belief that this was a line unto itself, meaning that once the plans are approved, it was just a matter of constructing it. The other aspect of this “line unto itself” belief was demonstrated in the suggestions that it could be built in the 404 corridor or the Woodbine corridor. The Don Mills/Leslie corridor was chosen as it is a natural extension of the Don Mills line that will be built south of Steeles. If the primary purpose of this project is for the heavy use during peak times primarily made up of commuters coming from the south and heading to the Commerce Valley/Beaver Creek area, then a more express route with fewer stops using the 404 corridor is not a bad idea. The trouble is, what is the best way to connect the Don Mills line with the 404 corridor? Steeles is pretty busy along that stretch, so perhaps the residents on the east side of Don Mills might prefer the line to go along Simonston Boulevard and cut through the back yards of the homes on Windsor Court Road to reach the 404 where it is much closer to Don Mills than it is at Steeles - that’s the ticket! It was not helpful that there was not one politician present at the meeting. Some may find that their offices may receive a few calls in the morning. There were some valid concerns regarding noise, which detailed analysis was not yet available. Also of concern was how much mess the construction would cause. The issue with few in the area likely to make use of the line was not totally the result of the car-centric mind set of York Region residents, but the neighbourhood is not exactly well designed for pedestrian access to Don Mills and Leslie. 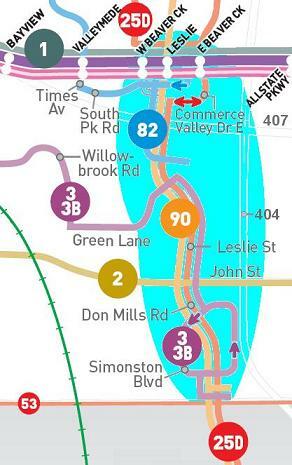 Except for homes on a street that connects with either Don Mills or Leslie, a walk to a stop that may be only directly less than 100 metres away can involve over three times that distance of actual walking. There were some dubious concerns. One woman questioned the safety of children having to cross a “rail line”. This will be a median right of way that will have movements controlled by traffic signals. If children will cross against the light when an LRT line is in place, they certainly must be doing it now. I have to ask how many children, and adults for that matter, dart out in front of a stopped bus simply because their light is green. We all know how well drivers wait behind the bus to make their right turns all the time, don’t we? One gentleman showed me his comment card that said, “Just put more buses on the road at rush hours.” I can really see how more buses will increase safety as impatient motorists floor it to get around them. I had to shake my head at some of the far out concerns. One made reference to last week’s derailment in Oshawa and if one were to occur on CN’s York Subdivision, how would evacuation be possible with an LRT line through the neighbourhood. Good grief! This line will not remove any driving lanes from the road. There will still be two lanes in both directions. In fact, in an emergency, the concrete-encased LRT lanes will provide 50% more road space for people to hightail it out of there! Then there was the concern about parking. If people in the area were to even consider using this line, there had to be parking lots at stops. When one of the presenters said there would not be parking lots at all of the stops, the crowd took that to mean that there would not be parking at any of the stops. The most likely stop to have parking will be the stop at St. Robert’s High School / 407 Transitway, as there may be a hub with the proposed Transitway that will see parking created on the west side of Leslie just south of the 407. Even so, this is more likely intended to be for cars coming off the 407 rather than people who live a few blocks away. The line of the night came from a guy who said roughly, “I have rapid transit now, it’s my car.” Fine, but I predict that gas will be over $2 per litre before this line breaks ground. This entry was posted on Thursday, June 18th, 2009 at 10:45 am	under Don Mills LRT, VIVA Next, Transit City, York Region, General Transit, General LRT. It wasn’t too long ago, back in 2008, that gasoline was so high that people demanded that something be done about it. So the powers that be came up with this plan to provide alternative means of transport. How quickly they forget. No, they want to continue to use their Hummers to drive in their roads in suburban sprawl to buy a lottery ticket. You will need to win big when gasoline returns and exceeds those prices of last year. Gasoline reached their low back in March because of the recession. Now the gas prices are going up. Before long, those same people will be demanding that the LRT plans be accelerated. First, it’s odd to see an LRT proposal in a city that is only just getting its feet wet with BRT. Second, where do commuters in this area actually want to go? If they are bound for the core area, that’s what GO Transit is for, not a Don Mills LRT. If their destinations lie on an east-west axis, the Don Mills line is at best a connector. Cal’s comment: For people in the community, at best it is a connector, whether to the Yonge Subway or to the Unionville or Langstaff GO Stations. The majority of users of this line are the people who work in the Leslie/Highway 7 area, and this group still has plenty of room for growth. One person at the meeting commented that this line will have some use when it opens, but once the subway opens to Richmond Hill, the usage of this line will disappear. I doubt that, because there are many people who commute to this area from the south and east who will not go over to Yonge to come back to Leslie. When I started working in this area, I lived in the Ellesmere/Morningside area and going over to Yonge to get to Leslie/Highway 7 was out of the question. Third, this is again an example of project based community consulting rather than network based. The regional plan is about a network, but the methodology condemns us to run line-by-line projects and deal with them outside of the larger context. A VIVA/LRT network may have produced even more outrage, but at least it would have given context to the Don Mills scheme. It certainly was being presented as a on-off project. It is really an add-on to the Transit City network that will go no further than the planning stage until the Don Mills line south of Steeles gets a break-ground start date. The announcement of this first meeting came out of the blue, as it was just another bullet point mentioned in the RTP. The presenters took a bit of a “we’re doing this study because Metrolinx wants us to” tone, sounding rather defensive. Btw, the idea of running the line along Hwy 404 for a part of its length should be considered seriously. The main intended market for this line will be commuters from the north-eastern parts of 416 heading to the offices in the Hwy 7 / Leslie area; secondary market is Seneca College students from anywhere in Markham. Both groups will benefit from a faster ride between Hwy 7 and Steeles. Cal’s comment: I have mentioned elsewhere that the Finch LRT line that was announced to go over to Don Mills and down to Sheppard might benefit from a 404 alignment. I even went so far as to say that a hydro corridor alignment east of Bathurst would be beneficial for a number of reasons including a more central stop for Seneca. Areas around Don Mills / Leslie between Steeles and Hwy 407 are mostly low-density residential and are unlikely to densify. To get from the Steeles / Don Mills intersection to Hwy 404, the line could either use a section of Steeles near the Steeles / 404 plaza, or it could continue about 500 m north of Steeles in the middle of Don Mills, and then tunnel north-east (400 - 500 m) under the residential houses. Either way, the line would then continue just east of Hwy 404 to Hwy 407, where it would turn west and reach Leslie, then continue north in the middle of Leslie. Perhaps it should even go up to 16-th Avenue, since many offices are located north of Hwy 7. A deep tunnel would be needed to do that, and I suspect residents in the area would be more likely to accept my suggestion about cutting through some back yards. This would be better on the west side of the 404 as well. It don’t see a conflict between the Don Mills / Leslie LRT plan and VIVA Next BRT plan. Both can be implemented in parallel, while at some later point the Hwy 7 component of VIVA might be converted to LRT. Presence of the Leslie and / or Jane LRT tracks will only help such conversion. These are the only two problems I can see with Don Mills / Leslie LRT: the fact that the ridership will be highly peak-hour oriented, and interlining with Finch / Sheppard Crosstown on Don Mills between Sheppard and Finch (combined frequency too high?) Anyway, the latter problem will present itself even if the Don Mills line terminates at Steeles. Most of the boards from the meeting are now posted on the vivaNext website. Cal’s comment: Thanks for pointing this out. I started checking each day for the first few days, then reduced my frequency!